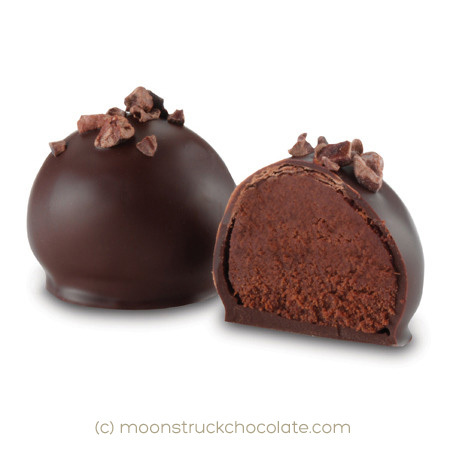 These decadent orbs of delight come from local Portland, Oregon Chocolatier, Moonstruck Chocolate. While their chocolates can be found in more upscale grocery markets throughout the U.S. (Market of Choice, Whole Foods, etc), visiting one of their Portland cafes makes for a more heightened moonstruck chocolate experience. Of all their shops, I love visiting their original teeny tiny downtown Alder Street cafe the most. It can only accommodate about 4 or 5 customers tops and feels like something from the early 1900’s. Every trip to Portland requires me to shop here at least once. An exotic ganache of whipped cream and single origin dark chocolate derived from rare and flavorful Triniterio cocoa beans from the Caribbean, resulting in hints of dried fruits and fresh tobacco. Enrobed in dark chocolate and topped with roasted cocoa nibs. Today’s inspiration has more to do with the words used to describe the truffle vs the actual image of the truffle…taking it from the ordinary to the extra-ordinary. If we were a moonstruck chocolate how would we describe ourselves?